Above: Sod Cutting Ceremony taking place. Left to right: Ben Whatling (Project Manager), Darryl Long (Finance Director), Duncan Haydon (Client), Steven Reason (Estimating Director) and Glenn King (Project Co-ordinator). Construction of the first phase of the Elm Farm Park Commercial Units B1 Scheme is set to begin later this month, after successfully obtaining Planning Permission in 2016. 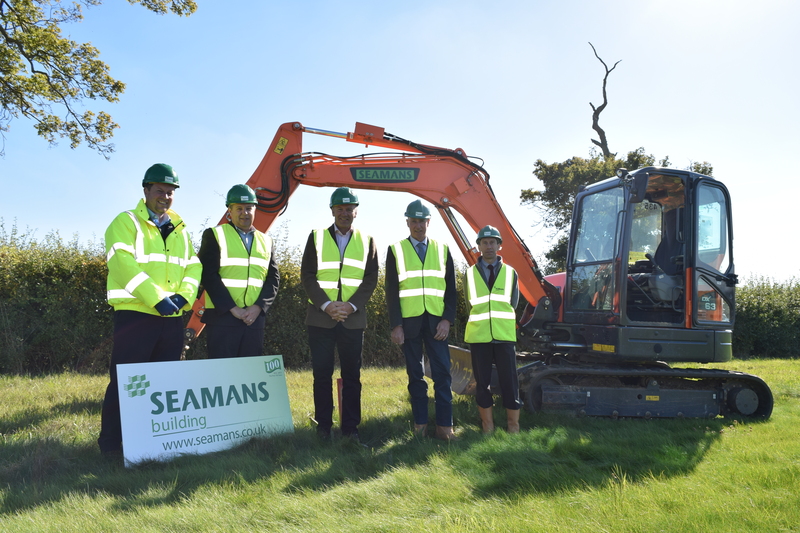 The site will comprise 3 offices and 9 high spec light industrial spaces, all located on the site between Thurston and Norton just off the A14 near Bury St. Edmunds. Elm Farm Park consists of a series of former Victorian agricultural buildings with more modern offices built alongside, overlooking open countryside. This entry was posted in Commercial & Public, News and tagged Ben Whatling, Commercial Units, Duncan Haydon, Elm Farm Park, Haydon Holdings ltd, Office Space, seamans building, suffolk on 26th September 2018 by Jenny.